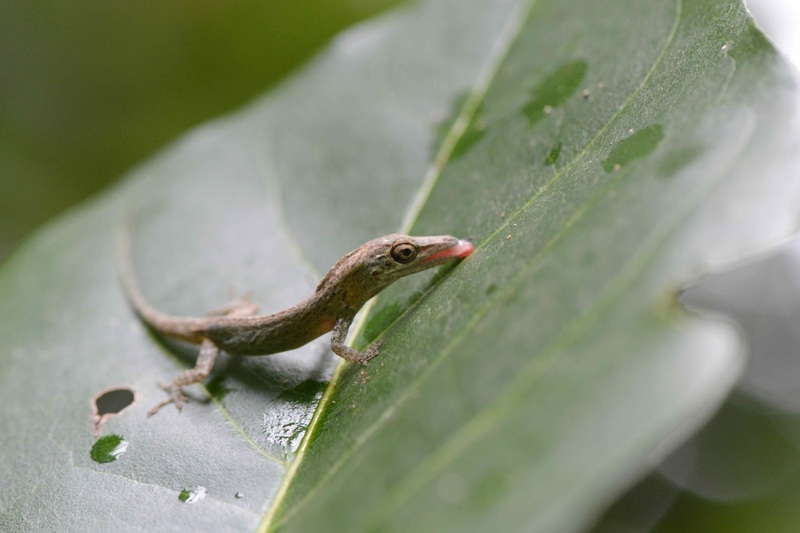 Anolis occultus, a member of the twig ecomorph group, is one of the most secretive species of lizard found in Puerto Rico. However, today I was lucky enough to observe a male A. occultus drinking water from the surface of a leaf. It was an amazing few minutes; after a very light rain, the individual began to search for water droplets on the surface of leaves. This was done by slowly walking while searching for the droplets. Once a water droplet was found, the individual would approach it and very deliberately protrude his tongue to lick the droplet as shown by the picture below. As an "Experimental Natural Historian" these are the moments that remind me, why it is critical to be in the field as much as possible. It only took a few tiny rain droplets to elicit the behavior, immediately raising the question of how a lizard can sense such a few rain droplets.